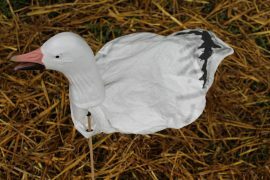 The Anser Decoy Company offers a complete line of American made Snow Goose windsock decoys. 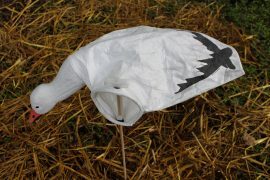 Our decoys offer many features that are both goose appealing and hunter friendly. A special ink recipe not only bonds well to the Tyvek bodies but is extremely flat to eliminate glare and our high-resolution details add true realism. The stay-open crush resistant collars help to maximize wind gathering on those low wind days. 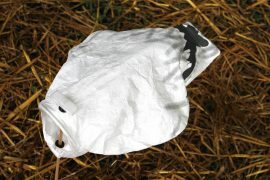 Our standard decoys also feature a collapsible back support which can be used anytime storage space is an issue whether on a trip or in the off-season. Tan fiberglass stakes blend into ground conditions and realistic, hand painted ABS heads are molded with a UV modifier to resist damage and yellowing from the sun.